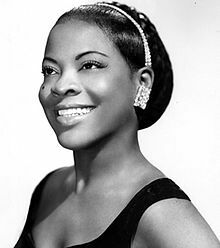 LaVern Baker (*) breaks onto the US charts with Jim Dandy to the Rescue, headed for US#17, R&B#1. ‘Little Miss Sharecropper’ got her start in Detroit. In 1953 she signed with Atlantic Records (started in 1947 by Ahmet Ertegun and Herb Abramson). Her first release, ‘Soul On Fire’, appeared in August. The Drifters ( Website ) , The Spaniels ( Website ) , Faye Adams, and Roy Hamilton ( Website ) . Got a message from a mermaid queen. She was hanging from a fishin’ line. Jim Dandy didn’t waste no time. Jim Dandy to the rescue! Go, Jim Dandy! Go, Jim Dandy! In 1955 LaVern got her first hit with Tweedlee Dee (US#14, R&B#4) . She’s seen in 1956 Freed film Rock, Rock, Rock. She’s inducted into the Rock and Roll Hall of Fame in 1991.
first NYC radio station to play The Beatles soon-to-be megahit I Want to Hold Your Hand. Beating out the 50,000-watt giants, it’s #1-rated in the NYC area from 1963 to 1966. Folk group The Weavers — formed in November 1948 by Ronnie Gilbert, Lee Hays, Fred Hellerman and Pete Seeger — gives a farewell concert at Orchestra Hall in Chicago. ‘The Weavers’ name comes from a militant 1892 play by Gerhart Hauptmann about a middle-ages peasant revolt. Their 1949 Leadbelly cover ‘Goodnight Irene‘ (written in 1936 in Louisiana State Prison) sold two million copies on Decca Records. They were blacklisted by parts of the entertainment industry during the McCarthy era. In 1953 Decca even tore up their contract and deleted their songs from its catalog. 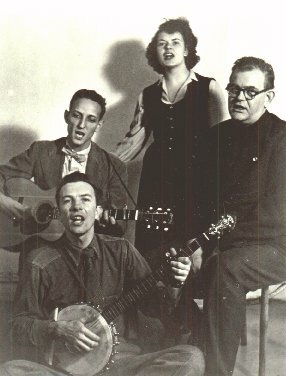 Seeger had founded the Almanac Singers in February, 1941; the group included Hays and eventually Woodie Guthrie. Critic Robert Christgau, however, gives it an A- … better than the best-selling album of 1972, Harvest. Young is inducted into the Rock and Roll Hall of Fame in 1995 and 1997. 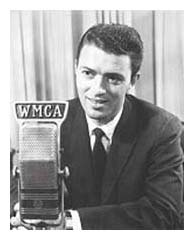 Anniversaries from music history, links to quality articles. The Rising Storm An mp3 blog about fine forgotten albums. Dr. Electro's Mixtapes is licensed under a Creative Commons Attribution-NonCommercial-NoDerivs 3.0 Unported License.